What was Al Gore's accomplishment? The production of a documentary film that propagandized the myth that global warming is due to carbon emissions. Big deal! And Jimmy Carter? Well, the worst president of the 20th Century distinguished himself as a rabid anti-Semite, a vociferous America-basher, and a gushing tyrant-lover. And then, of course, there was the worst Nobel Peace Prize of all of them — the one awarded in 1994 to the world's leading terrorist, Yassar Arafat, a modern-day Hitler. 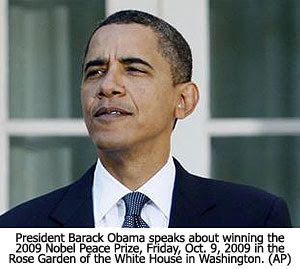 When that occurred, I lost all respect for the Nobel Committee and their meaningless prize. The President has engaged in America-bashing everywhere he has spoken in the world, as if this nation is the world's greatest threat to peace, when, in actuality, we have always been the world's best defender of freedom. The President has denounced the "Lone Ranger" foreign policy mentality of the Bush Administration, a foreign policy that rightfully put this nation's interests first and successfully protected us from terrorist attacks for seven years. The President has made it clear that he is willing to abandon Israel for the sake of "peace" in the Middle East. In short, we are headed for disaster on both the national and international scenes, so the President had better enjoy the world's spotlight now before all the lights go out. Aren't the candidates submitted for the award sometime in January, like 12 days prior to Obama taking office? He must have been selected on his campaign promises - what a joke! What I like about this article is that Dr. Reagan condensed all of the madness about Obama into seven very clear and distinct points. Better yet... I agreee with them all! See...I did it again...BY anyone, not "be". Aaaaaaaaaaargh!!!!! !